Product prices and availability are accurate as of 2019-04-19 14:36:56 UTC and are subject to change. Any price and availability information displayed on http://www.amazon.com/ at the time of purchase will apply to the purchase of this product. 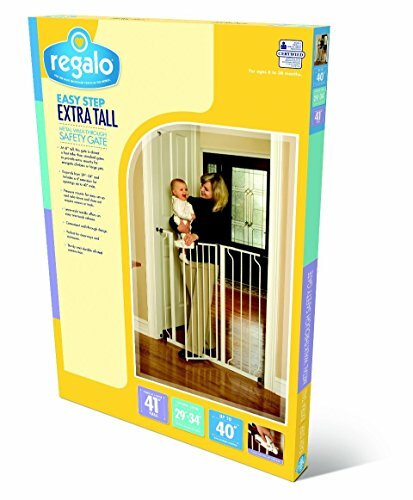 The deluxe easy step extra tall safety gate is perfect to fit a variety of openings in your home. This gate covers openings 29 to 37.5" wide and stands 41" tall. This gate includes a 6" wide extension kits. The adjustable pressure-mounting system makes installation quick and easy. When your hands are full the convenient one-hand walk through design makes your job a little easier. The latch style handle also comes equipped with a safety-locking feature. The all steel construction makes this gate sturdy and durable. This home decor safety gate is the perfect combination of function and fashion. This gate is PVC free and has been certified by the Juvenile Products Manufacturers Association (JPMA). It also meets the safety standards set by the American Society for Testing and Materials (ASTM). Great for pet's too.Can also be used for medium to large dogs.